Magwitch did many things, all of which lead to little money and lots of trouble. A deserted soldier in hiding taught him to read. A traveling giant (from a freak show?) taught him to write. But still, in and out of jail. The man Magwitch fought in the marshes was named Compeyson. This fellow was brought up a gentleman, with boarding school, a watch and chain, ring and brooch, and good-looking to boot. Compeyson took Magwitch on as a partner. His business was forging stolen bank-notes and such. He kept out of jail by having someone else (Magwitch) do the dirty work. He’s described as heartless, “cold as death” and as having the “head of the devil”. 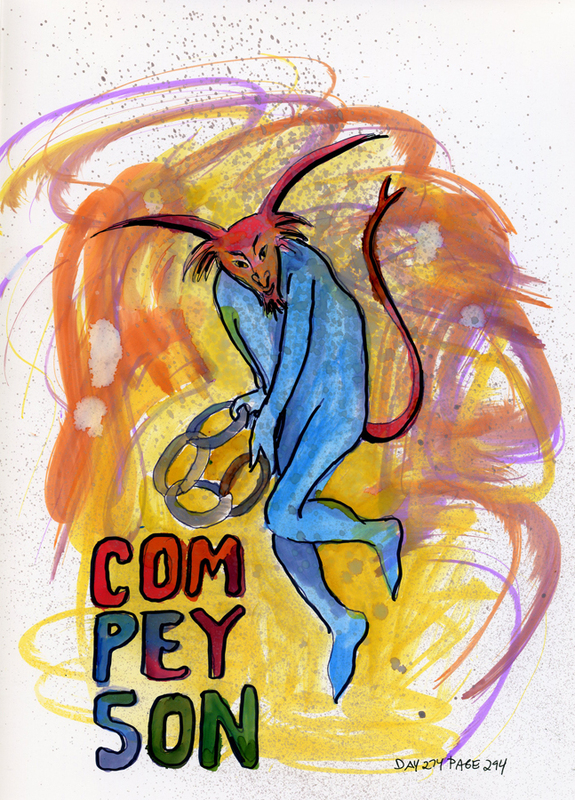 I based my alcohol ink painting on a liquor poster of a devil uncorking a bottle. This famous poster was painted in Paris by Capiello in 1906. I’ve always loved that poster!